More than 400 civilians have been killed in a five-day assault by Syrian government and Russian forces on a rebel-held enclave that had last year been designated as a “de-escalation zone,” reports said. 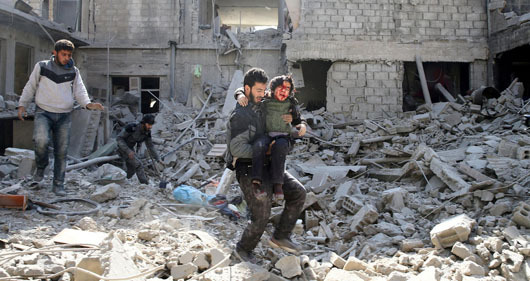 The attacks in Eastern Ghouta killed 46 people on Feb. 22, AFP reported. Russia, Turkey and Iran in 2017 had designated Eastern Ghouta as a “de-escalation zone,” meaning civilians could reside there without being targeted by any party in Syria’s war. Doctors Without Borders said 13 of the facilities it supports in Eastern Ghouta were damaged or destroyed in airstrikes this week. Russian Foreign Minister Sergei Lavrov said during a press conference in Belgrade that anti-Assad regime fighters in Eastern Ghouta had rejected an evacuation deal. “A few days ago, our military in Syria suggested to the fighters that they withdraw peacefully from Eastern Ghouta, like the evacuation of fighters and their families that was organized in East Aleppo,” he said, according to AFP. Meanwhile, Russian news reports said Moscow has sent more warplanes to Syria, including its latest Su-57 fighter jets.